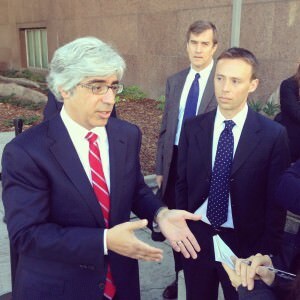 Plaintiffs’ attorneys Ted Boutrous, left, and Josh Lipshutz, right, with Students Matter founder David Welch in the background. As the California Supreme Court considers whether to take up an appeal of an appellate court ruling in Vergara v. California, which has been extended to Aug. 22, the advocacy group that brought the landmark case will be in a Northern California courtroom Friday for a hearing on a case involving teacher evaluations. Last year Students Matter filed a lawsuit, Doe v. Antioch, against 13 California school districts, saying collective bargaining agreements in those districts violated the Stull Act by explicitly prohibiting the use of student standardized test scores in assessing teacher performance. LA Unified is not a party of the lawsuit. The Stull Act, passed by the state Legislature in 1971, requires student progress to be included as part of evaluations of teacher job performance. After former Superintendent John Deasy opted to make student achievement account for 30 percent of teacher evaluations, UTLA filed an unfair labor practices complaint in 2013 against the district with the Public Employment Relations Board, or PERB. The union and the district had agreed to include student test scores as part of evaluations, but did not agree on a specific numeric requirement, union officials said at the time. Attorney Joshua Lipshutz, of Gibson, Dunn & Crutcher, who is representing Students Matter said he will ask a Contra Costa County Superior Court judge on Friday to grant a writ of mandate, essentially a court order requiring the school districts to comply with the law. Lipshutz said after the judgment was made in the lawsuit against LA Unified, he hoped other school districts would comply with the ruling on their own even though they weren’t required to. The districts didn’t, he said. “The same system ruled to be illegal in Doe v. Deasy is the same thing that’s in place in all of these other districts,” he said. Although different from Vergara, this lawsuit matches Vergara’s overall theme of ensuring teacher quality. By challenging the state’s employment laws that safeguard ineffective teachers, Vergara is focused on a small number of “grossly ineffective” teachers, Lipshutz said. Specifically, Vergara challenges the last-in, first-out statute dictating seniority-based lay-offs, teacher tenure and procedures for firing teachers. A state Superior Court judge ruled the laws violated students’ constitutional rights. An appellate court overturned the ruling in April. Students Matter then filed an appeal. The California Supreme Court has yet to decide whether it will take up the appeal. Earlier this month, it extended the time it will take to make its decision from the end of July to Aug. 22. The Doe v. Antioch lawsuit is focused on enforcing the state law already in place on teacher evaluations. “We think it’s very important to understand who are your good teachers and who are your less good teachers,” Lipshutz said. The Stull Act requires that teacher evaluations include: pupil progress, instructional techniques and strategies used by the employee, employee’s “adherence to curricular objectives” and establishment and maintenance of a suitable learning environment. Lipshutz said after the lawsuit was filed, several of the school districts amended their contracts to remove the language prohibiting the use of standardized test scores in teacher evaluations. He said in doing so, the districts were in effect admitting they were violating the Stull Act, but, he said, the districts are still not in compliance with the law because the evaluations have not changed. He said both sides have held status conferences with the judge and the school districts have submitted documentation. Both sides agree on the facts of the case, Lipshutz said. The lawsuit was brought against the largest school districts that had collective bargaining agreements that prohibited student test scores in teacher evaluations, Lipshutz said: Antioch Unified, Chaffey Joint Union High School District, Chino Valley Unified, El Monte City School District, Fairfield-Suisun Unified, Fremont Union High School District, Inglewood Unified, Ontario-Montclair School District, Pittsburg Unified, Saddleback Valley, San Ramon Valley Unified, Upland Unified and Victor Elementary School District. The districts serve 250,000 students. He said the school districts have argued that they do take student scores into account, that the Stull Act gives districts discretion on using test scores — and they could opt not to use them — and there is no reliable way of using student testing data. Lipshutz said he hopes to convince the judge otherwise and felt confident, given the writ issued in the Doe v. Deasy case, although that decision is not binding on other parties. Lipshutz said there is no enforcement mechanism that monitors whether school districts are following the law. The California attorney general could enforce the law but so far hasn’t, Lipshutz said. He said it is often pressure from unions in negotiating with the districts that compels the districts into putting in the clause prohibiting student scores in teacher evaluations. “Really, we’re hoping the ruling will help the districts because it will give them another tool in bargaining with the unions,” Lipshutz said.